Spoon chicken and broccoli slaw into lettuce leaves. Sprinkle with scallions and cashews. Time-saving tip: Use store-bought rotisserie chicken. 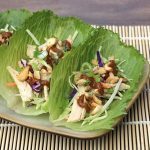 Nutritional information for the lettuce wraps does not contain the hoisin sauce, but you can see it with the Homemade Hoisin Sauce recipe below.